Korumburra, a rural town in west Gippsland’s Strzelecki Ranges, is 105 km south-east of Melbourne and 33 km south of Warragul. According to Bunce's Language of the Aborigines of the Colony of Victoria (1859), Korumburra is an Aboriginal word meaning maggot, possibly relating to the giant earthworms found in the district. The name was given to the survey parish before the town. The Korumburra district was part of the vast Wild Cattle pastoral run (1846) stretching inland from Venus Bay to Poowong. 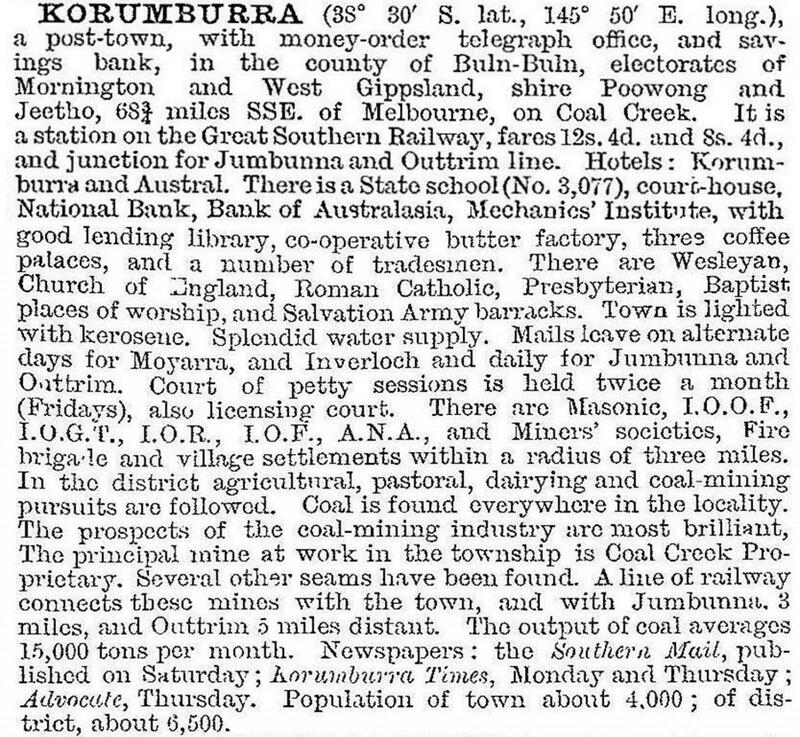 In 1878 coal was discovered at Coal Creek near the future town of Korumburra. Tracks had been cut through the thickly forested hill country: chief among them was Whitelaw’s track (1874) from Foster, north-west to Coal Creek and then north-east toward Morwell. His track joined McDonald’s track (1862) which went from Lang Lang to Poowong. In 1878 farm selections began in the Coal Creek area. They were at the eastern limit of settlement, as towns and villages were established at Jeetho, Nyora and Loch. The proposed Great Southern railway, however, was an ambitious project intended to cross the Koo Wee Rup Swamp and reach into the heart of the Strzelecki Ranges. A prime objective was to reach the coal deposit. Construction began in 1888 from Dandenong and the final section from Loch to Korumburra opened in 1891. The project was sufficient incentive for the Korumburra township to be surveyed in 1887. By 1889 ratepayers and residents of the Nyora and Loch district were unhappy about local government of their area being conducted by Buln Buln shire in Drouin. They successfully agitated for a separate shire. In 1891, when the railway reached Korumburra, the new shire was proclaimed, a mechanics’ institute and a school opened in Korumburra and a Wesleyan church opened for worship. The shire was headquartered at Jeetho, but ultimately would have its offices in Korumburra. The agricultural and pastoral society held its first show in the mechanics’ institute in 1893. The emphasis was on dairy produce, poultry, home produce and homecrafts. Later shows featured decorations and arches built from coal. In the early years of the dairy industry there were factories at Bena, Poowong and Kongwak. In 1901 a factory was opened at Korumburra and it had a life of 70 years. The dairy factory outlasted the Coal Creek mines which faced decline as mines at Jumbunna, Outtrim and Wonthaggi came into peak production. A few were worked spasmodically until the 1950s. The country around Korumburra was cleared and saw-milled, assisted by severe bushfires in 1898. As well as dairy produce there was livestock sold through the Korumburra shire saleyards (1901). From 1891, Korumburra was part of Poowong and Jeetho Shire. Due to the town’s increasing importance, the administrative centre was moved from Jeetho to Korumburra in 1908 and in 1922, the shire took Korumburra’s name. The town progressed steadily. A bush nursing hospital was set up in the early 1930s. Higher elementary school classes were commenced in 1920 and a high school instituted in 1954. Housing shortages after World War II were remedied by the gradual construction of over 100 houses by the Housing Commission. The butter factory expanded, continually modernising operations and becoming a major employer in the town. During the 1960s and 1970s, several mergers left Murray Goulburn in control, production at Korumburra was reduced in 1973 and in 1975 the Korumburra factory’s laboratory, the last activity kept going, was closed. Operations were transferred to nearby Leongatha. A cordial factory, established in the 1890s, produced Joe’s soft drinks from 1948. Joe’s was well known through South Gippsland until its closure in 1986. A timber preservation works commenced operations in 1960. Throughout the postwar years Korumburra was eager to have new industries in the town, but the Latrobe Valley claimed much of the development and the near neighbour, Leongatha, had better luck and prosperity. Korumburra is still important as a market and service centre for the surrounding prosperous farming area. The South Gippsland Highway passes through Korumburra but the railway line closed in 1993. Tourist trains now use the line. The railway station, a fine Queen Anne style building constructed in 1907, is listed on the Victorian Heritage Register. In 1974 Coal Creek Historical Park, a coal mining town of the turn of the century, was recreated in the area between two rail lines, just to the east of the town. The giant earthworms that are found in the surrounding district are the theme of the Karmai Festival held each March. The Coal Creek historical park proved to be a drain on the former shire council’s time and money, but dedicated volunteers keep it going. More recently, Korumburra township has been identified as having several heritage precincts around the churches and school. Korumburra has State and Catholic primary schools, a secondary college, a hospital, a showground, golf, bowls and swimming venues and a shopping centre along the Commercial Street boulevard. Burra Foods (1990) from the Goulburn Valley acquired the butter factory and produces cheese, whole and powdered milk and related food ingredients. Their workforce of 60 is about one third of the old factory’s workforce at its peak. Korumburra primary school had 418 pupils and the secondary college had 406 pupils in 2014. Plans to redevelop the former saleyards into a shopping precinct were put forward in 2013.